Danco Plc have invested in a fleet of Palfinger CR253 4W TMFs which have become an integral part of their logistics and marquee installation system. 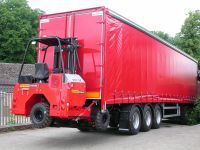 Initially Danco Plc looked to the Palfinger truck mounted forklift to help with self loading and unloading; the every day job of the Palfinger TMF and combined with the 4-way system the handling of the long marquee structures was made easy. 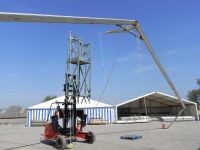 As Bennett looked further into the Danco operation it could be seen further uses could be found for the Palfinger TMFs in the erection of the large clear-span framed marquees. These large frames needed to be pulled into position about the fixed hinged points at the base of the frames. This would normally involve taking a large telehandler to site or a lot of hard work with many personnel. Bennett could see a solution and working with Danco designed and built a marquee jib system. The solution - Fitted with the Bennett Marquee jib the Palfinger CR253 4W is driven into position and the handbrake applied. The pulley rope is attached to the top of the frame then the mast lifted. This new system allows the large frames to be erected quickly and safely with just two personnel even in confined spaces. 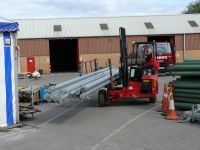 Access all areas - If the lorry was too large to get near to the marquee site then the transporting the long sections was previously a problem with a telehandler. The Palfinger CR253 4W can change to a sideloader at the touch of a button enabling the transport of even the longest lengths through gateways and down narrow lanes. 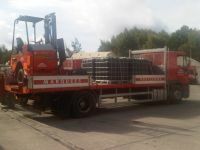 To allow Danco further flexibility Bennett designed and built a top mount system to allow the Palfinger CR253 4W to be transported on vehicles not fitted with the rear mounting brackets.